In this video we will discuss how to identify object dependencies in SQL Server using SQL Server Management Studio. 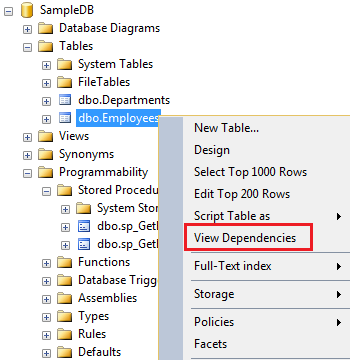 In the Object Dependencies window, depending on the radio button you select, you can find the objects that depend on Employees table and the objects on which Employees table depends on. Identifying object dependencies is important especially when you intend to modify or delete an object upon which other objects depend. Otherwise you may risk breaking the functionality. For example, there are 2 stored procedures (sp_GetEmployees and sp_GetEmployeesandDepartments) that depend on the Employees table. If we are not aware of these dependencies and if we delete the Employees table, both stored procedures will fail with the following error. There are other ways for finding object dependencies in SQL Server which we will discuss in our upcoming videos.